It has been very moist here in Boston (and tropically warm today.) Prime season for mushrooms, like this one growing out of a tree stump. 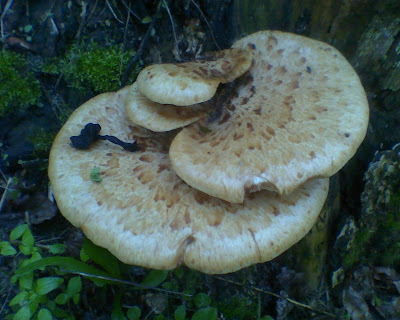 Thanks to John Halamka (aka Geekdoctor), we learn that this specimen is "a harmless polypore." Among other accomplishments, John is one of the region's most knowledgeable mycologists. By "harmless," I think he means edible. I was told by folks at Mass Audubon that all tree-growing mushrooms in this region are edible. They are not always tasty and tender, though. Humorous addendum from John: Instructions for eating a polypore - boil for 60 hours, then enjoy. Tastes like cardboard. Mmmm. Your local transplant surgeons would rather you were safe then sorry and not consume ANY wild mushrooms as some can cause liver failure.